Phillips Vision Plus is the Award Winning Ultimate vehicle lighting upgrade and can be fitted simply and quickly for less than the price of half a tank of fuel. You may feel relieved that your car has technical safety features such as an airbag and ABS. But would it not be better to avoid a situation where they may be needed by simply fitting better lighting. The Philips Vision Plus Xenon headlight bulbs provide up to 50% more light on the road. Up to 50% more light on the road. Better reflections from road signs. UV resistant Cut Quartz safe to use with plastic lenses. Optimises colour temperature to give deep white light. Fully Compliant with ECE Regulation 37. Interchangeable upgrade with existing head lamps fitted with H7 (477) Bulb. Includes 2 x H7 12v 55w Performance Bulbs. 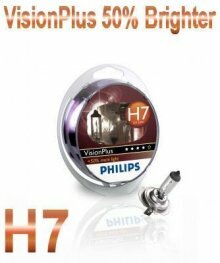 To make sure that this is the correct Bulb for your car, Please remove your exsisting bulb from car headlight to see if it has H7 or 477 marked on it or check your owners manual.